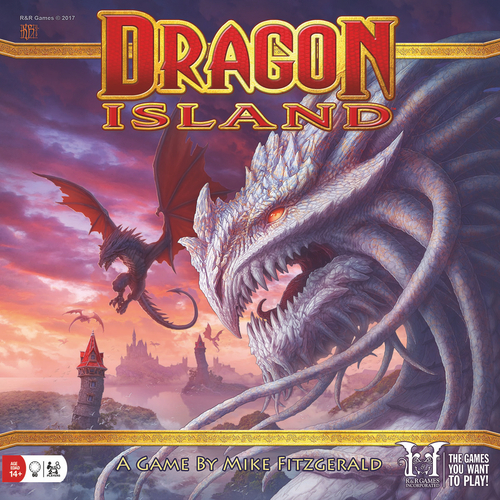 In Dragon Island, players are Wizards stuck on an island filled with Dragons. 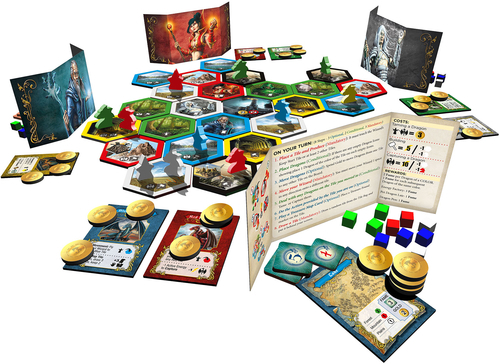 The island itself is made up of double sided hex shaped terrain tiles – starting with the Wizard’s keep tile in the center of the table to start. Each player gets their Wizard Start tile (in their player color) as well as a random tile, a treasure map card and a screen to hide all of their stuff behind. Players also get a set of Pet Dragon cards, one in each of the 5 colors. Place a tile from behind your screen. You can choose which side is showing. It must touch either the Wizard’s Keep tile or touch at least two other tiles. Then, take an energy cube matching the color of the tile you placed PLUS one cube/coin for each tile that it touches. 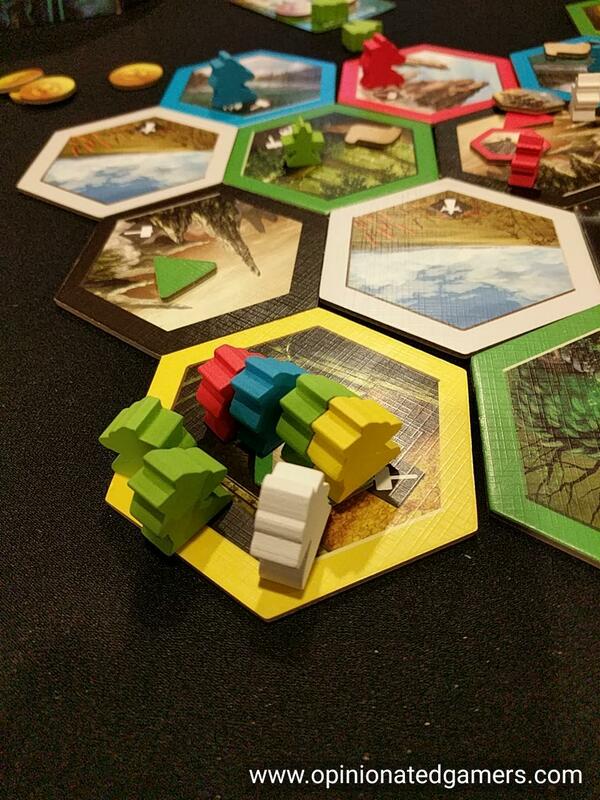 (Yellow hexes provide coins, not cubes – and the Wizard’s Keep tile also provides a coin). If there are any Dragon Icons on the board which do not have Dragons nor Buildings on them, fill those hexes with Dragons to match the icon/hex color. Spend 1 gold coin to move a Dragon from one tile to any other tile on the board – except the Wizard’s Keep. If you move a Dragon into a Dragon Pen, it is captured there and can no longer move. You must move your wizard to a new tile each turn. Three options: A) Move one space adjacent, B) Move to the tile where your Pet Dragon is and then either stay there or move one space adjacent, C) Move to the Wizard’s Keep and then either stay there or move one space adjacent. Regardless of which option you use, if you move to a space with Dragons on it, you must be able to deal with those Dragons or you cannot move there. TAME THE DRAGON – If there is only one Dragon on the tile, you can tame it and make it your pet. You can only have one pet of each color. Place the matching Dragon Pet card in front of your screen and place $3 on it. As long as you have money on this card, that dragon will be your pet. Pet Dragons give you extra options when moving your wizard as you can fly to them. Each color of Pet Dragon also has a special ability that they grant you. CAPTURE THE DRAGON – Capture any/all dragons on your tile with 10 Active Energy cubes. Active Energy cubes are those of colors of either the tile you are taking the action on OR tiles adjacent to that tile. If you are on your home terrain, you get a discount of one cube. You score 2 Fame Points for the first dragon of each color that you capture and 1 Fame point for each other. This is based on the icon at the bottom of the tile. This may be to build a building on the tile (if there isn’t one already there) for 5 Active Energy cubes. It may be to collect 2 Gold coins. It may be to use Telekinesis to take a cube/coin from the tile you landed on and then coin/cubes for all tiles in any one direction in a straight line. It may be to allow you to draw 2 Treasure Map cards, keep one and discard the other. 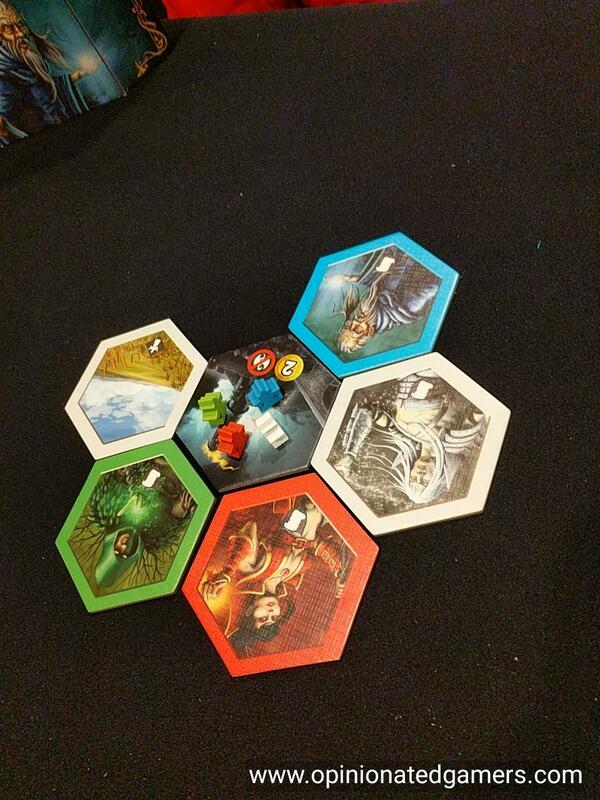 Treasure map cards have a listing of hexes on them. If the tile you are standing on has adjacent tiles that match the list on the card, you can turn in the card for the points/coins listed on it. Place a Treasure Found marker on that tile. Each tile can only be used once to find treasure. The game ends with the last tile is played to the board – Setup ensures that all players will have an equal number of turns. Your final score is the total of all the Fame Points collected during play PLUS one Fame point for each gold coin remaining on your Pet Cards. The player with the most points wins. Ties go to the player with the most different color dragons. I had been hearing Frank from R&R rave about the game since Origins, and I was glad to get my hands on a copy to try out. The turn flow seems confusing at first with its eight discrete phases, with some being mandatory and others not, but honestly, once you take two or three turns, it becomes second nature and actually quite intuitive. Player count might affect your strategy – but the increasing number of turns with fewer players means that there are still a good number of tiles on the board that you were responsible for playing. There will be fewer total tiles though, and this make make it harder to score map cards. On the other hand, as you will also play a larger role in the placement of those tiles – and this may help you score more of the complicated treasure map tiles. The obvious play for the dragons is to get resources to build a Dragon Pen building so that you can then hoard the dragons as they come on the board. The cost for capturing Dragons is fairly high – 10 resources – and from my plays, it seems to make the most sense to wait until the end of the game to return to your pen and capture all the dragons in your Pen. As it costs you 1 Gold per dragon move, you need to constantly be trying to earn coins in order to move those Dragons to your pen. So, thus far, the strategy seems simple. Build a pen, hoard dragons, collect them at the end, and then get treasure maps in the interim. But… there’s more to consider. The big branching point in the strategy are the pets. You can have one pet of each color, and each of them grants a different special ability. I prefer the powers of the Gold (+1 VP per treasure map) and Blue (Draw 3 and keep 2 maps) pets, but I have seen the powers of each be used well in my games so far. In addition to the special action, the Pet can bring you up to 3VP at the end of the game, and that’s nothing to sneeze at either. The art on the tiles and player screens is great. I really liked the art that Kerem Beyit did for Spellcaster (another R&R release), and his fantasy themed art fits in quite well here. The thick color borders on each tile seems garish at first, but it really helps gameplay as the tiles are easily identified, and I think that this increased functionality definitely is worth it. There is a nice cloth bag included with the game – which could stand to be slightly larger for a 4p game. When you use the maximum number of tiles, there isn’t much room for shuffling. The bag, however, works great for the 2p game when there are only 18 tiles in the bag. 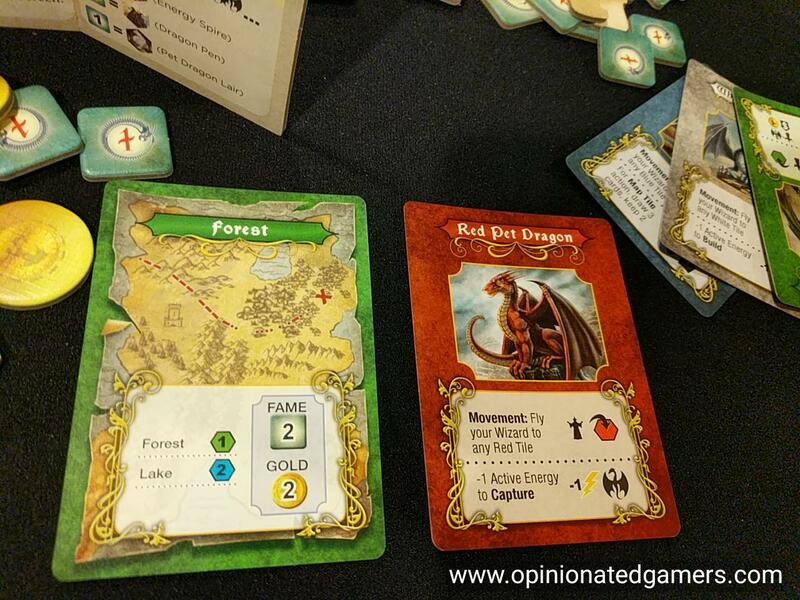 Dragon Island provides a nice tactical challenge. You have a limited number of turns to accomplish VP scoring moves, and (At least for me), it is not obvious that there is one route which is consistently better. Trying to maximize your actions – both in number and in efficacy – is the key here. The overall weight of the game is actually fairly light, and this would be suitable for families as well as serious gaming groups.